Website, Hosting, Monitoring System and Content Management. MonitorMyWeb is a website and server monitoring service. The service allows clients to monitoring uptime and receives instant alerts whilst providing insights into the performance that can assist in SEO, visitor experience and functionality. The autonomous system ensures that client updates can be completed 24/7 and requires minimal set up for the client&apos;s websites/servers. We developed a website and back-end system based on the client&apos;s specification and aspirations of new functionality. The website was created using DYSC CMS and feature a customised theme. 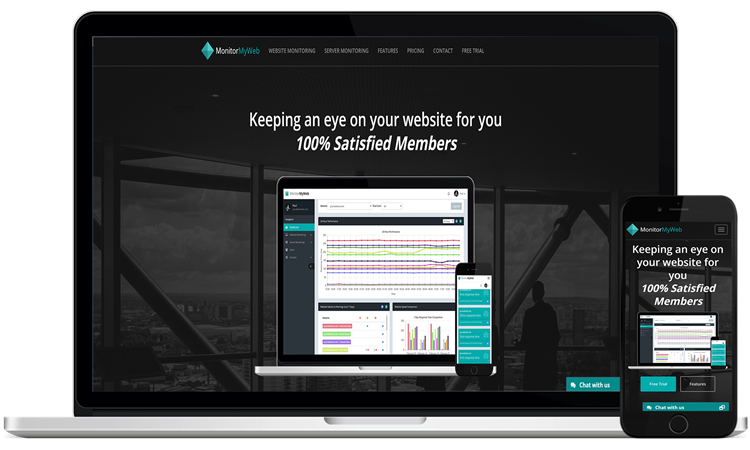 MonitorMyWeb were looking to expand their monitoring systems service to include server monitoring on top of just website monitoring. They requested DYSC to develop a back-end system which allows accounts to have custom servers monitored and also re-skin the system for a better user interface. In addition, MonitorMyWeb were seeking a new website design to match the new look of their system. The team at DYSC set out by designing a back-end system which initially achieved the functionality before altering the design of the front-end development. Following the development of the functionality, we designed a new logo which incorporated a simple design and matched the previous branding. These colours and design then lead to form a key component of the website design.